Undergoing regular dental cleanings is an essential part of periodontal (gum) disease prevention. While a daily habit of brushing and flossing cleans bacterial plaque from most tooth surfaces, it’s difficult to remove from places your brush or floss can’t access well. That, as well as hardened plaque deposits known as calculus, must be removed by a hygienist or dentist with a technique known as scaling. Scaling is traditionally performed manually using specialized hand instruments known as scalers. 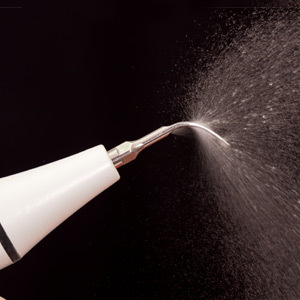 Although hand scalers are quite effective, they must be used carefully to avoid damage to gum tissue or, during deeper cleaning known as root planing, the tooth roots. A different method for plaque removal known as ultrasonic scaling has grown in popularity as an alternative to manual scaling. Ultrasonic scaling uses equipment emitting vibrational energy that crushes and loosens plaque and calculus, and disrupts growing bacterial colonies in biofilm. Plaque particles are then washed away using water irrigation. The most recent models of ultrasonic scalers have matched the effectiveness of hand scaling in removing plaque and calculus in shallow gum pockets, and surpassed the manual technique in cleaning out pockets greater than 4 mm. In experienced hands, they’re kinder to tooth structure and other tissues. Water irrigation also improves healing by removing bacteria and scaling by-products, which also makes the area easier to view by the hygienist. On the other hand, any type of power scaler must be used with caution with patients who have pacemakers, and are not recommended for those with hypersensitive teeth or teeth that are in the early stages of de-mineralization. The technique may also produce an aerosol of finely misted particles (with possible contamination) that requires added measures to contain them. For most patients, though, ultrasonic scalers are an effective tool for plaque and calculus removal. As ultrasonic devices continue to evolve, patients will ultimately benefit from greater comfort and reduced treatment times.